Most surely, the seeds that began a lifetime of creative endeavors were sown when I was very young. Drawing has always been a natural activity. 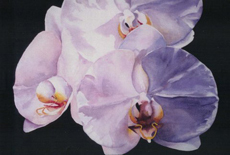 Studying first in oils, I was able to use my knowledge of anatomy in many painting classes and drawing sessions. 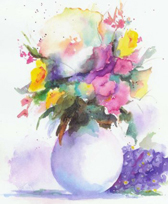 Watercolor painting, however, captured me with its mystery and the poetry of its soft and natural shapes. I am continually challenged and delighted by the swoosh of paint on wet surfaces. 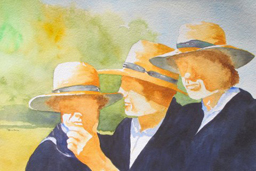 I am always enthralled with the process of beauty when one can paint outside the lines. 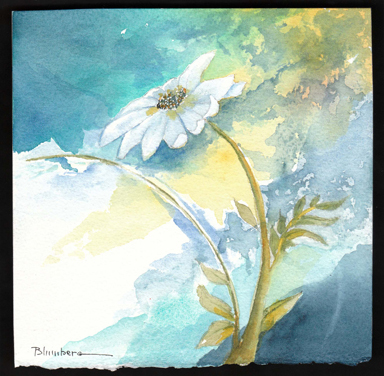 It is my goal to store precious memories of painting, teaching, participating in exhibitions and broadening my techniques in the love of watercolor. 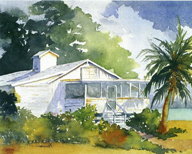 2008—2016 Workshops in watercolor at the Art League School, Alexandria, Va.
1991—present Personal Instruction with internationally known artists from 1991 through today. 2010 Instructor, Interior Design, Focus on Fireplace Lounge, Calvert Pines Senior Center and personal designs for all students. 2009—10 Gallery Manager, CalvART Gallery, Prince Frederick, MD. 1982—2003 Mary Blumberg Interior Design, Inc.
Museum of Art, Ft. Lauderdale, Fla.